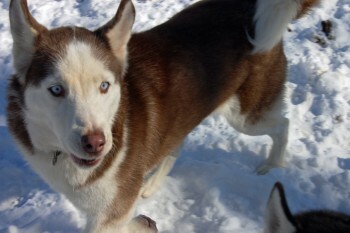 Ivy is a beautiful 2.5 year old Siberian Husky with a red and white coat and baby blue eyes. She came into rescue because her prior home was unable to keep her. 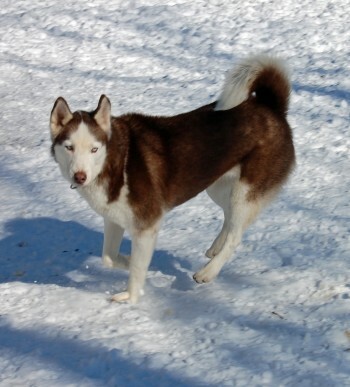 She quickly adapted to her foster home and the other huskies. Ivy is a very social girl and gets along with the other Siberians. She is very affectionate with all of the people she meets ~ there are no strangers in this girl’s world. She loves to give hugs! She is very playful; however, no longer has all that puppy energy. She enjoys cuddling after a good romp with the pups. Ivy has a dog’s eye view on all issues and isn’t shy about speaking up. This girl has a lot of “woo woos” to share and she is very talkative. Ivy has looks, beauty and a personality to match ~ all she needs now is a family to love. If you are interested in a new best friend, please ask us about this sweetheart.